Leighton is considered by many as a master painter of the female form. His most famous work, Flaming June, is the centrepiece at the Museo de Arte de Ponce in Puerto Rico, attracting millions of viewers every year. 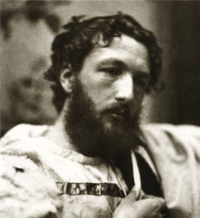 About the artist: Frederic Leighton (1830 – 1896) was an English painter and sculptor. His works depict historical, biblical and classical subject matter. Leighton’s delicate and detailed painting of the female form is still admired in art circles today. His most famous artwork, Flaming June, is currently on display at the Museo de Arte de Ponce in Puerto Rico, and is considered a masterpiece. There is much debate about Leighton’s sexuality. We know he engaged in a short relationship with the poet Henry William Greville, whom he met in Florence in 1856. The older man sent Leighton several letters, but the romantic affection seems not to have been reciprocated. Leighton never married, but was thought to have had an illegitimate child with one of his models. Leighton was knighted at Windsor in 1878, and made a baronet of Holland Park Road in the Parish of St Mary Abbots eight years later. He was the bearer of the shortest-lived peerage in history; after only one day his barony became extinct upon his death.